Romans 12 is my favourite chapter in the Bible, and it’s the one chapter that I recite everyday like a manifesto when I wake up. It has aided me through various ups and downs, and therefore every single verse in this chapter has immense significance to me personally. Romans 12:9 onwards is a lesser-known passage on love, often overshadowed by the gentler passage on Love in 1 Cor 13, but I like the directness here. In this study, perhaps the one concept I want to focus on is the term ‘cling to’. I like that term, I think it is extremely apt. There are three parts to this verse, each tells you how to love, what to hate, and what to hold on to respectively. Let’s do this briefly step by step. Love must be sincere – 1 Corinthians 13 tells us very clearly what love is – but here the emphasis is on the genuity of love. Not love that wears a mask; not love that is born out of hypocrisy, not compassion for the sake of appearances, but true, genuine, heartfelt love. Paul doesn’t tell us what to love – we know what love is from 1 Corinthians 13, and we know how to love – with sincerity – but we aren’t told what to love. Money? People? God? – well, the next part on hate gives us a clue. Hate what is evil – What is the opposite of love? Some say it’s fear – quoting 1 John 4:18 – There is no fear in love. But perfect love drives out fear, because fear has to do with punishment. The one who fears is not made perfect in love. That’s probably very right. If you have a spectrum of love and fear, they are opposites. You can love and fear the same things. That’s why they are opposites. If you have perfect love for something, there is no fear. In that equation, there should be no hate. Love and hate aren’t technically opposites. Hate is merely the absence of love. 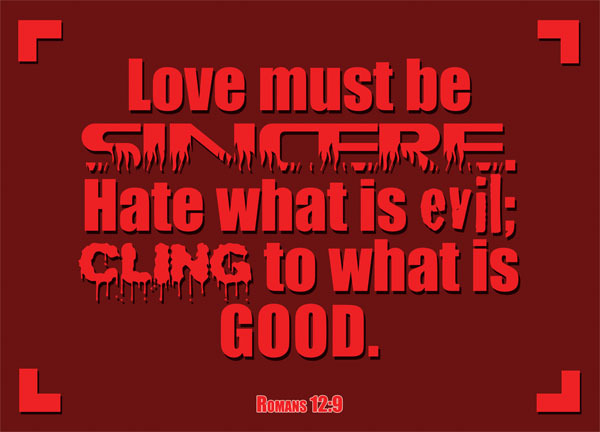 Hate what is evil – the sin, not the sinner. Don’t hate what you should be loving. Don’t hate anything that is not evil. And if we love the Lord, let us hate evil – Let those who love the LORD hate evil, for he guards the lives of his faithful ones and delivers them from the hand of the wicked [Psalm 97:10]. Cling on to what is good – Oh, how I love this expression. It doesn’t tell us to cling on to what we love. No. It tells us to cling on to what is good. That is so precious. We just have to keep our sights on what is good and hold on to it with a sense of desperation that the term ‘cling on to’ provides us with. Everything that is good will lead us to God. Don’t hold on to what we love, what we hate, what we desire – but simply hold on steadfastly onto the things that will lead us to God. Hold on tightly. Desperately. Let ourselves be firmly attached to what is good. What to you hold on to? What do you cling on to? I definitely cling on to a lot of unnecessary things. We surely do. I’m sure we do cling on to good things – like how we do cling on to God’s words, God’s promises and so on. But on top of that, our attachments to certain things can be fatal. When we cling on to worldly things that cannot lead us to God, when we become too harped on certain things or people, we will find ourselves increasingly unable to hold on to God’s words. Isn’t that life? At the end of the day, it’s about what you cling on to most. It’s about what you prioritize most. In your daily lives, it probably doesn’t matter that much, but in that crucial moment, the truth is that blatantly harsh. Do you value God more, or do you value other things more? Do you cling onto God more, or do you cling onto other things more? If one arm is grabbing on to God’s words, and the other on a human relationship, and they are moving in opposite directions and about to stretch you apart, which do you let go at the end? If you do not let go of one, you’ll probably break apart. That, to me, is what clinging is.